1. A vehicle of class LE first registered in New Zealand on or after 1 January 1978 is not fitted with one pair of lamps to the front and one pair of lamps to the rear. 2. A vehicle of class LE first registered in New Zealand before 1 January 1978 is fitted with more than one pair of lamps to the front or more than one pair of lamps to the rear. 3. A vehicle other than class LE first registered anywhere on or after 1 July 1967 is not fitted with one pair of lamps to the front and one pair of lamps to the rear. c) three pairs of lamps (including top-mounted lamps) to the rear if the vehicle is an emergency vehicle. b) top-mounted lamps that are not mounted as close as is practicable to the top corners of the bodywork. 6. A vehicle is fitted with more than two side-facing lamps on each side of the vehicle. 7. A vehicle is fitted with a lamp that is not in a pair. 8. A vehicle is not fitted with a visual lamp indicator device that indicates to the driver that a lamp has failed ( only where one was fitted as original equipment). b) mounted as far towards each side of the vehicle as is practicable. 10. A retrofitted lamp, other than a top-mounted lamp on an emergency vehicle, is fitted at a height from the ground exceeding 1.5m (or 2.1m where fitting below 1.5m is not practicable due to the shape of the bodywork of the vehicle). 12. A lamp is insecure or, if a mandatory lamp, contains moisture in the form of large droplets, runs or puddles. 13. A lens is missing, or has a hole, crack or other damage that allows moisture or dirt to enter. 14. A lamp’s reflector is damaged or has deteriorated so that light output is reduced. 15. A visual lamp-failure warning device is obscured from the driver in the driver’s seating position. iii. at a different rate from other lamps on the same side. g) altered, eg due to damage or modification. b) 45˚ inboard or 80˚ outboard. 20. On a vehicle of American origin fitted with combined stop and indicator lamps, the stop lamp function is not overridden by the indicator function. 21. Where a lamp comprises an array of light sources (eg LEDs), fewer than 75% of these operate. 22. A visual lamp indicator device does not operate. Direction indicator lamp means a lamp designed to emit a flashing light to signal the intention of the driver to change the direction of the vehicle to the right or to the left. A permitted (ie non-mandatory) rear or a non-OE side-facing direction indicator lamp that does not comply with equipment, condition and performance requirements must be made to comply or disabled so that it does not emit a light. 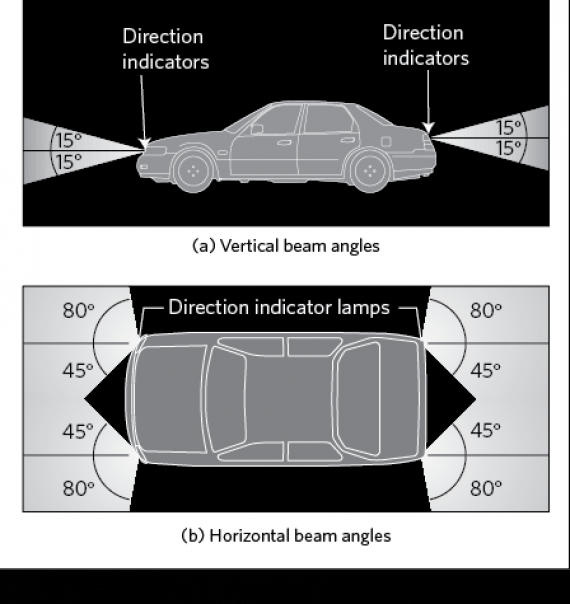 Vehicles first registered in New Zealand before 27 February 2005 may have rear direction indicator lamps that also function as reversing lamps. A vehicle originally manufactured with a direction indicator lamp arrangement that differs from what is required or permitted in this section may retain the original direction indicator lamps provided they remain fitted in their original position and perform as intended by the vehicle manufacturer. Some vehicles are equipped with OE or after-market daytime running lamps (DRLs) that also incorporate position lamp and direction indicator lamp functions. When the DRLs are on (when headlamps are off), and an indicator lamp is activated, the corresponding DRL is temporarily extinguished or dimmed. When the position lamps are on and an indicator lamp is activated, the corresponding position lamp may remain lit. 1. A vehicle other than class LE first registered anywhere before 1 July 1967 may be fitted with one or two pairs of lamps to the front and one or two pairs of lamps to the rear of the vehicle. 2. A vehicle other than class LE first registered anywhere on or after 1 July 1967 must be fitted with one or two pairs of lamps to the front and one or two pairs of lamps to the rear of the vehicle. 3. A vehicle of class LE first registered in New Zealand before 1 January 1978 may be fitted with one pair of lamps to the front and one pair of lamps to the rear of the vehicle. 4. A vehicle of class LE first registered in New Zealand on or after 1 January 1978 must be fitted with one or two pairs of lamps to the front and one or two pairs of lamps to the rear of the vehicle. 5. An emergency vehicle may be fitted with an additional pair of indicator lamps at the rear of the vehicle that must be symmetrically mounted as near to the top corners of the bodywork of the vehicle as is practicable (top-mounted lamps). 6. A vehicle may be fitted with one or two side-facing lamps on each side. 7. A suitable device must be fitted that indicates to the driver the failure of a mandatory lamp. b) at a height from the ground not exceeding 1.5 m, or if this is not practicable due to the shape of the bodywork of the vehicle, not exceeding 2.1 m.
10. On vehicles of American origin, the stop lamp and direction indicator lamp function may be combined in one lamp. 12. A direction indicator lamp must operate in a way that is appropriate for the lamp and the vehicle. c) amber to the side. 14. A lamp must flash at a fixed frequency in the range of 1–2 Hertz. 15. Each lamp in a pair must, when operated, emit a light of approximately equal intensity, colour and frequency. 16. The lamp-failure indicating device must function. 17. A lamp must emit a light that is visible from 100m during normal daylight and 200m in normal darkness. 19. If a vehicle of American origin is fitted with combined stop and indicator lamps, the indicator lamps must override the stop lamps so that the stop lamps operate as direction indicators. 20. Where a lamp comprises an array of light sources (eg LEDs), at least 75% of these must operate. 21. A direction indicator lamp that is affected by a modification must meet equipment, condition and performance requirements. Page amended 28 April 2014 (see amendment details).